We have been doling out information pertaining to Captain America: The Winter Soldier in dribs and drabs. Empire put Chris Evans and a few Cap co-stars on its cover. Now we have images that accompany that cover story, giving us some great looks at next year’s Marvel sequel. The four new shots, also courtesy of Empire, show heroes in various stages of action. 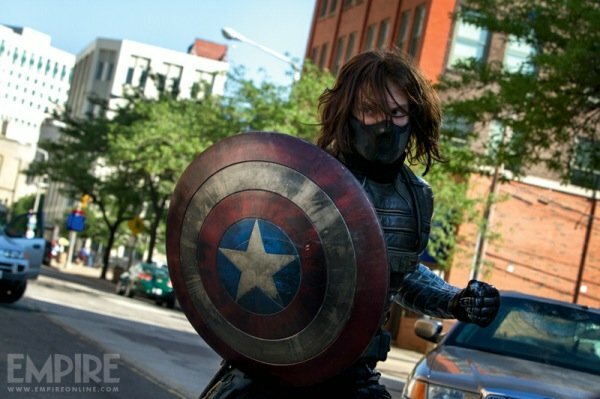 The best, though, absolutely has to be the Winter Soldier, aka Bucky Barnes, holding Cap’s battle-scarred shield in his hands. God, I can’t wait to see the circumstances that lead to Cap’s nemesis clutching the first Avenger’s signature weapon. Who else do we get to see in these new images? 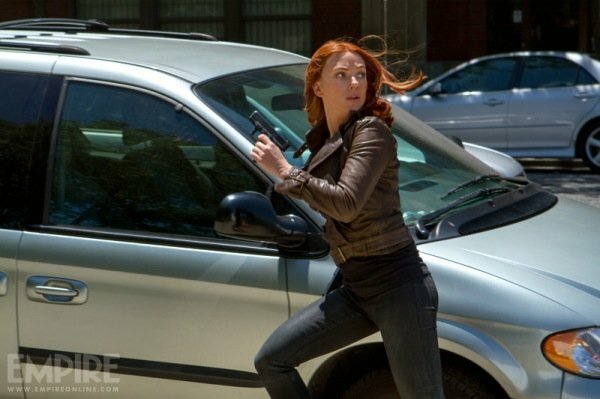 Black Widow (Scarlett Johansson) clutches a hand cannon as she appears to be dodging an attack. We have been hearing that The Winter Soldier amounts to a team-up effort for Cap and Widow, and everything that we are seeing in trailers and photos confirms this knowledge. 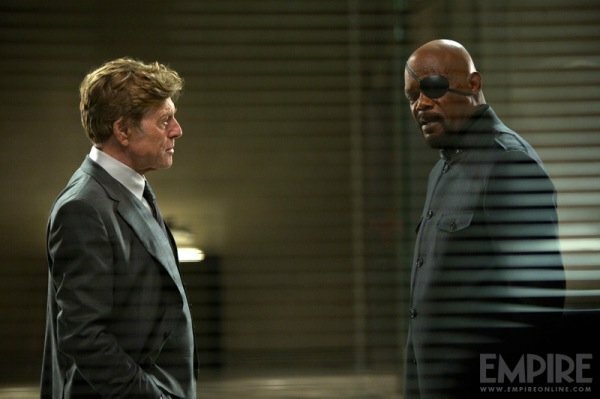 Nick Fury (Samuel L. Jackson) returns, and will be joined by S.H.I.E.L.D. veteran Robert Redford. 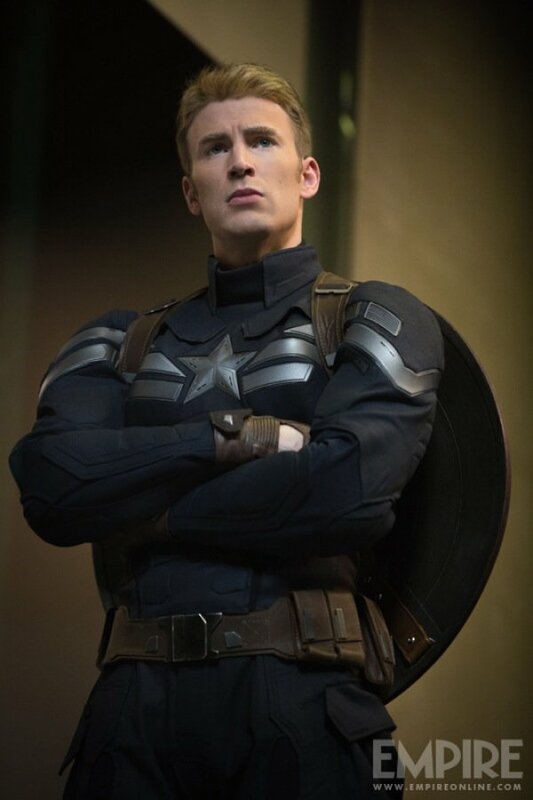 And in the final image, Evans strikes a noble, handsome pose as Cap. It’s hard to believe this dude was the wise-cracking Human Torch not so many years ago. What a rebound. Marvel kicks off 2014 in April, when The Winter Soldier blasts into theaters. The studio follows up with Guardians of the Galaxy in August, and both movies are attempting to set the stage for Joss Whedon’s The Avengers: Age of Ultron. Expect to see a steady stream of promotional images and clips for The Winter Soldier to keep sprinkling over the Internet. Marvel knows what it is doing in this marketing game, having pushed Iron Man 3 past the billion-dollar mark and powering the second Thor movie to $629M worldwide. Next year is going to be an exciting stage for Marvel, starting with Cap 2 on April 4. What do you think about the images?